Working nights has really made me love breakfast. Since I have to be into work by 2:30 or 3, I don’t feel like I really have time to make a nice recipe for my blog on days that I work, but breakfast is a different story. I can wake up early, make a delicious meal, and still have time to photograph it before work. I never was a huge breakfast recipe fan before, but lately I have been loving making delicious, over-the-top breakfast dishes. This recipe was a little creation I made one morning when I was a little burnt out on bagel sandwiches and oatmeal. I wanted to make my recipe healthier than your traditional eggs Benedict, so I made a shrimp and tomato mixture for the filling, but still decided to go with the delicious hollandaise sauce. This looks simply delicious! 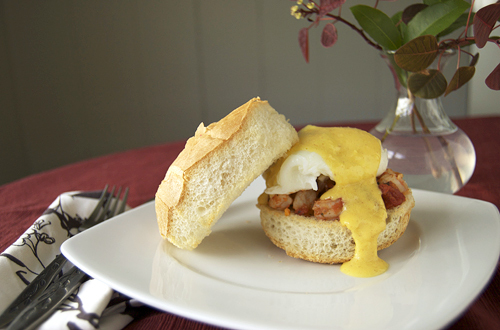 Yes, you have to keep the hollandaise sauce for egg benedicts! You got very creative! Loved the quote from your last post too. You’re my hero just for making light hollandaise! 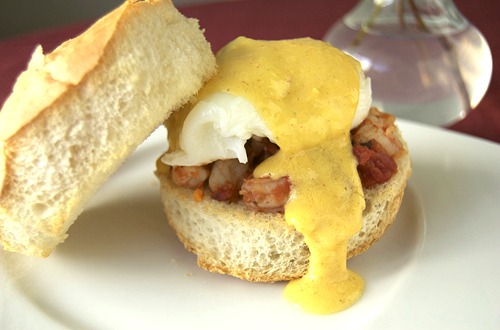 But mmm, shrimps with egg benedict sounds like brilliant creation. This looks amazing- just did a version that used smoked salmon, but your shrimp version looks great and I could use some light Hollandaise (since I have a heavy ladle hand!) Thanks for friending me on Foodbuzz! Glad I found you.